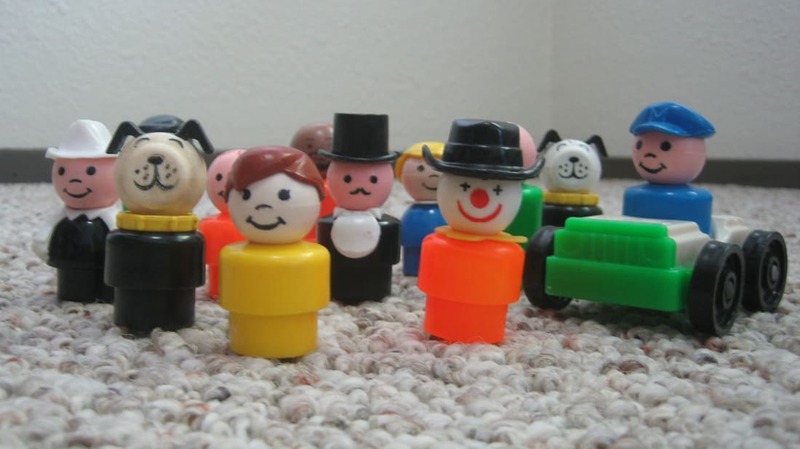 Chances are, you've played with Fisher-Price's Little People toys at some point. The simple, round figures were a staple of toy boxes throughout the 1970s and '80s, and have become one of the longest-running toy lines in American history. With over 50 years on the market, the story behind these little folks is filled with fun and fond memories, sure to bring out the kid in all of us. Little People has its roots in the early 1950s, where barrel-bodied figures with spherical heads were seen as the drivers in pull-along toy cars. But these characters were attached to the vehicles, so they were never the main focus of play. All that changed when Fisher-Price introduced the Safety Bus in 1959. Similar to its predecessors, the toy was a plastic school bus with the driver permanently attached. However, it also came with six child passengers who could be removed from their seats. Now, instead of just pulling a toy car behind them, children could make the characters act out pretend scenarios and let their imaginations run wild. While most of us think of the iconic “peg” style of Little People, with the abrupt taper at the waistline, it wasn't until 1965 that this design was finalized. Before that, the figures' bodies were straight cylinders, then square, then triangular, and one playset even had teardrop-shaped People. The peg style was the standard for decades, but then came the release of the 1986 best-seller Toys That Kill, a book warning parents about dangerous toy recalls. Over the years, there had been reports of kids choking on Little People figures, but only after the toys had come apart—which was a rare occurrence without some form of tampering. If the book had merely mentioned the toy line, the public reaction might not have been that bad. But because three Little People were prominently featured on the cover, the figures became the spherical face of toy recalls. The controversy spelled the end of the peg design, but there's no question it had a good run—from 1965 until 1990, about 800,000,000 Little People had been sold. To ease the minds of concerned parents, Fisher-Price went back to the drawing board and released the “Chunky” Little People, as collectors call them, in 1991. The Chunky form was essentially the same as the peg body, but wider and shorter to make the parts impossible to swallow. But sales dropped sharply, as older kids felt the design catered too much to their little brothers and sisters, putting Little People into the very unpopular “baby toy” category for many youngsters. The Chunky style never really caught on, so, in 1997, Little People underwent yet another redesign. The figures were now molded plastic and featured greater detail on the face, hair, and clothes. They also had additional attributes that changed the look of Little People forever—arms and hands. With a new look came a new direction for the toy line, as a handful of figures were given names and personalities so they could become identifiable characters. This brand anchor helped Little People break out into a claymation TV show, books, live performances, and even video games. Some child advocates were dismayed by this new aspect of the toys, saying that one of the greatest strengths of Little People over the years was that kids could invent their own characters with the fairly generic figures. However, parents and kids still flock to the toys, the DVDs, the books, the live show shopping mall tour, keeping the brand very popular today. Many vintage Little People have names. The seven main figures that made up the basic Play Family line included, Mom, Dad, boys Pee Wee and Butch, girls Patty and Penny, and everyone's favorite, Lucky the dog. Of course kids never used these names; they just substituted in whatever they liked. At various times, Fisher-Price had named the dog Snoopy or Fido, but when they found out that kids were calling him Lucky instead, they decided not to fight it any longer and just made that his official name. The key to Little People's success has always been the playset. For one price, kids got figures, accessories, a vehicle, and a building they could use as the basis for their tiny adventures. The Play Family Farm was introduced in 1968, the first “Play and Carry” set where all the pieces could be stored inside the main building and carried by the plastic handle on the roof. This $9.99 set (about $60 today) also marked the debut of the ingenious and infamous “Moo-ooo door,” a mechanism that sounded like lowing cattle when you opened the barn door. During the Little People heyday of the 1970s and '80s, Fisher-Price released many playsets, including the Play Family House (1969), the Action Garage with a real, working elevator for cars (1970), the School (1971), the Airport (1972), the cowboys-and-Indians-inspired Western Town (1982), a Fire Station (1982), and plenty more, which have been released and re-released over the years with occasional design tweaks to keep them fresh. The Farm, however, has been their most successful playset, selling more than 16.5 million units since 1968. It's still produced today, and the modern set features, in addition to the "Moo-ooo door," the sounds of a horse, sheep and chicken too. One of the most popular Little People playsets, Sesame Street, debuted in 1975, becoming the first licensed toy in the lineup. The playset was a recreation of the show's urban locations and included characters like Bert, Ernie, Big Bird, Oscar the Grouch, Cookie Monster, and the only three vintage Little People that were based on real people, Mr. Hooper (Will Lee), Gordon (Roscoe Orman), and Susan (Loretta Long). The set was an instant hit, so Fisher-Price released another, the Sesame Street Clubhouse, in 1977. The Clubhouse was an original environment designed solely for the toy line and never appeared on the actual show. But kids didn't seem to mind because the set featured plenty of cool stuff, like trap doors, slides, and a moving sidewalk. This set included Big Bird, Bert, Ernie, the Count, Grover, and Roosevelt Franklin. To add to the Muppet cast, Fisher-Price sold packs of Sesame Street figures separately that included Prairie Dawn, Herry Monster, Sherlock Hemlock, and Mr. Snuffleupagus. The Sesame Street line was only produced for four years, ending in 1979, but it was long enough to make a lasting impression on a generation of kids. It was 15 years after the Sesame Street set debuted that Fisher-Price partnered with McDonald's to release their next licensed playset. In 1990, just before the peg body type was redesigned, a Mickey D's restaurant set was packaged with Little People versions of Ronald McDonald and the Hamburglar. When the figure design changed to the Chunky body a year later, the McDonald's set changed with it. And when the Chunky sales dropped, so did the sales of the McDonald's set, meaning it was only on the market for a couple of years before it was discontinued. Of course with great prosperity comes those who want a piece of the pie. During the Little People's heyday, many companies produced characters that were at the very least inspired by the Little People design. PlaySkool, for example, released a series of playsets and figures called “Familiar Places,” which were about the same size as Little People, but whose bodies and heads were square. Toy manufacturer Illco went so far as to make Disney and Peanuts figures that were so similar to the peg design, they could actually fit into Little People furniture and cars. For some crafty fans, just because Fisher-Price never released Little People in the form of some of their favorite characters, that hasn't stopped them from making their own. With a little paint, some modeling clay, and a whole lot of love, fans have modified Little People to look like the cast of The Lord of the Rings, the Muppets, Indiana Jones, and such non-kiddie fare as The X-Files. One of the more unusual Little People bootleggers is musician and pop culture geek, Suckadelic. Through his website, fans can buy limited edition Little People made to look like characters from Star Wars, G.I. Joe, the shark from Jaws, as well as Suckadelic's own unusual creations.